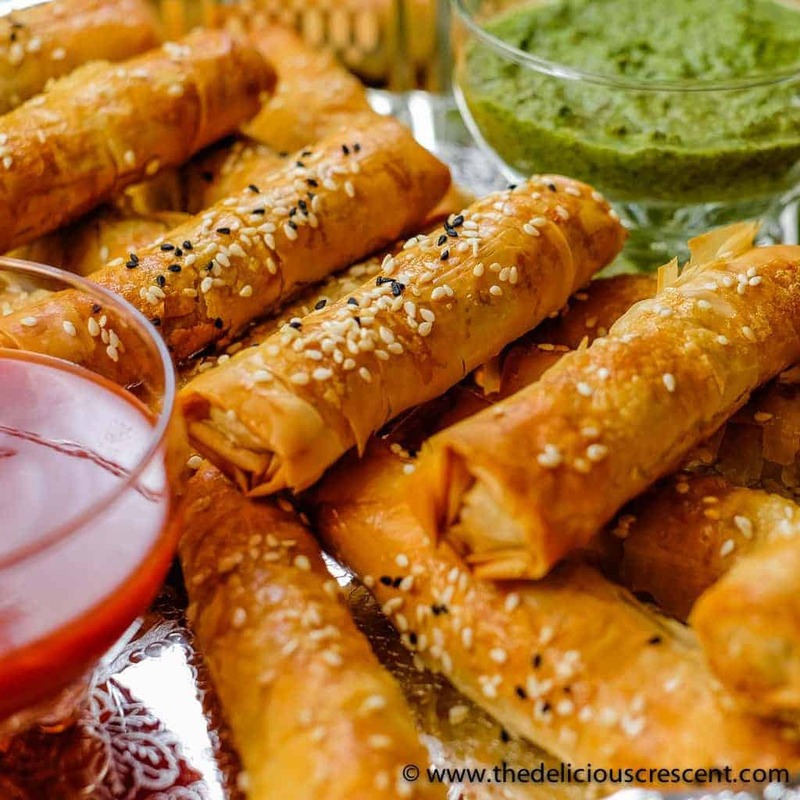 Crispy Potato Edamame Cigar Samosas – an easier and lighter baked version of a hugely popular spicy Indian snack, loaded with flavor and boosted in nutrients. Samosa is the quintessential Indian snack that dots the lavish tables of the opulent banquet halls, trendy restaurants and all the way to the street vendor stalls of India. I grew up making samosas from scratch, the dough included. But when you want to have this tasty snack more often, then you have to create a lighter and easier version. And importantly something that is handy enough to satisfy your craving when you need it – meaning that which freezes well. Nowadays there are a variety of readymade dough available to make these delectable savory pastries. Many of them work the best when they are deep fried. I wanted to try a baked version using phyllo dough, which also gives it a delicate crispiness. And to add some novelty, I shaped it in a handy cylindrical form. The traditional and popular version of samosa usually comes with a potato filling. Here, in this Crispy Potato Edamame Cigar Samosas, I added some edamame which boosted the protein and nutrient profile. Also these beans have a green pea like bite, so they add a nice textural aspect. Edamame are the young beans harvested before they harden into the more mature soybeans. They are low in calories, high in protein and fiber. And a good source of iron, calcium, folic acid, vitamin K and vitamin C.
Edamame have a complete protein that provide all the essential amino acids required in the diet. These young beans are high in polyunsaturated fat and especially in omega-3 fatty acids. Studies have shown that edamame consumption may be linked to a lower risk of age related mental disorders. Since the beans are lower in cholesterol, high in fiber and good quality protein, they are also associated with a reduced risk of atherosclerois and hypertension. The phytoestrogens in edamame, known as isoflavones, have been suggested to lessen the risk of osteoporosis, improve the regulation of blood sugar, prevention of migraine headaches and even mitigation of PMS symptoms. In particular, the antioxidant properties of the isoflavone – genistein may inhibit the growth of cancer cells. These Crispy Potato Edamame Cigar Samosas freeze very well. So you can prepare a big batch, freeze and bake them as needed. And what more do you need, when they spring back to their crispy originality when you lightly bake the leftovers that have softened a bit in the refrigerator. 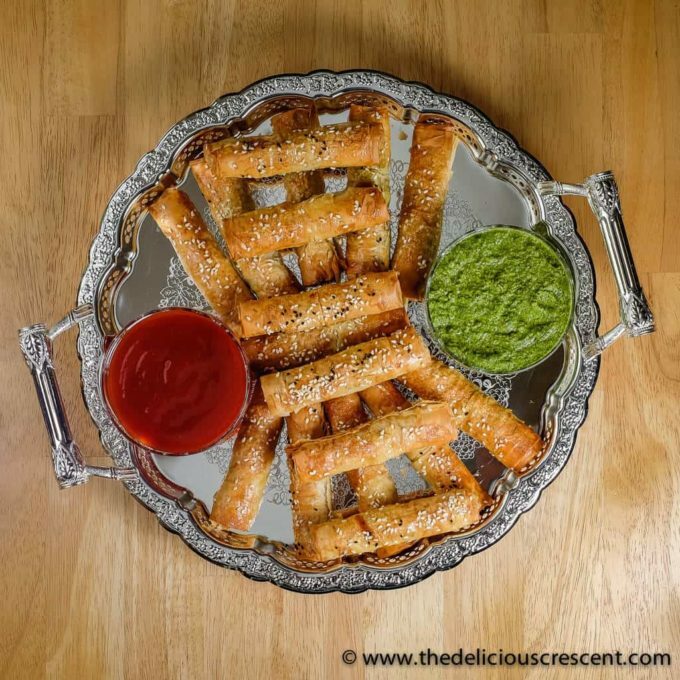 Enjoy these handy snacks with a cilantro mint chutney or a tangy sweet chili tomato sauce. 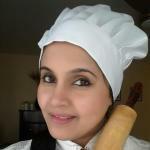 Talking about tasty, light appetizers and snacks, here are some really healthy and tasty recipes to try – Quinoa Crusted Eggplant Chickpea Patties and Mushroom Dumplings in Garlicky Yogurt Sauce. 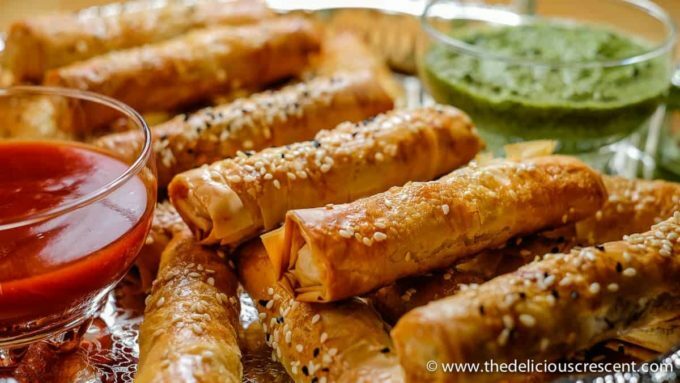 Crispy Potato Edamame Cigar Samosas - an easier and lighter baked version of a hugely popular spicy Indian snack, loaded with flavor and boosted in nutrients. 8 ounces phyllodough 20 sheets, 9" X 14"
Thaw the Phyllo dough as per instructions - overnight in the refrigerator and an additional 3 to 4 hours at room temperature. Boil the potatoes until soft. Allow to cool. Peel and then crumble the potatoes. Boil or microwave the edamame beans in some water until cooked soft. Heat 1/2 tablespoon oil in a cooking pot. Add cumin seeds and when they start to splutter add the chopped onions and sauté. Make sure to add the onion before the cumin seeds start to turn too brown. Then add the ginger garlic paste, garam masala, turmeric and stir few minutes. Add crumbled potatoes, boiled edamame, jalapeno, cilantro, lemon juice and salt as per taste and mix it all together. Remove the phyllo dough sheets out of the package, unwrap and cover it with a damp thin kitchen towel. Mix the remaining oil with the whisked egg very well and set aside. Unroll one phyllo sheet and lightly brush the oil-egg mixture over half the sheet and fold it over. 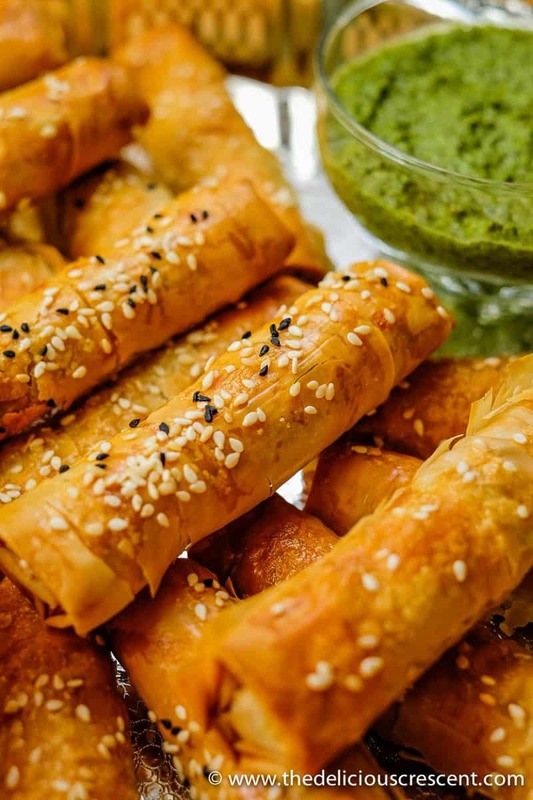 Place 2 to 2½ tablespoons of the potato edamame mixture along the center of the shorter side of the folded phyllo sheet leaving an inch on each side. Fold over the edges of both the long sides of the phyllo dough over the filling and roll it up into a cigar shape making sure to brush a little bit of the oil-egg mixture or water to seal. 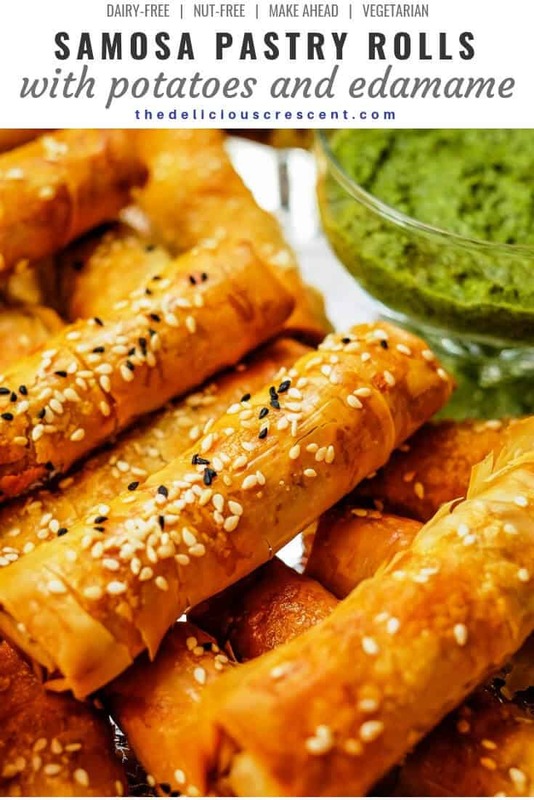 Place the prepared Crispy Potato Edamame Cigar Samosas on a parchment lined baking sheet leaving gaps between them. Lightly brush the tops of the samosas with the oil-egg mixture and sprinkle the sesame seeds/black seeds or carom seeds. Traditionally carom seeds are used which impart the characteristic flavor to samosas. Bake for about 15 to 20 minutes until nicely golden brown. Thanks Sonal. Hope you like it. These are so pretty and would make a great holiday appetizer! Thanks Janice. And yes they will be great for an appetizer. I would love these, such awesome flavors! These look great! My husband is a huge fan of Indian food. How fun it would be to make these at home. Thank you :). Wow, nice that he likes Indian food. Enjoy!